Tonka Water has been selected by Minnesota Governor Mark Dayton’s Office as one of the recipients of the Governor’s International Trade Awards for 2014 in the Manufacturing/Services category. The award requires that a significant portion of business is international growth and the business demonstrates advancements in the international market over the previous three years, likelihood of further growth, maintaining or increasing employment in Minnesota due to international trade activity, and development of a creative approach and/or strategy in international business. For Tonka Water, this award is in recognition of business activity and growth primarily in Canada. Tonka Water has more than 30 installations in Canada, and has experience working on water treatment projects with municipalities, First Nation communities, as well as the industrial sector. 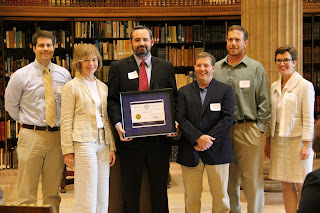 An official award ceremony with the Governor and the Minnesota Trade Office was held in early June. In addition to this award, Tonka Water has participated in or hosted several round-table discussions sponsored by the Minnesota Trade office over the past year.